Vitamins C and E along with the B-complex are formulated at levels higher than a “one-a-day” multi. Vitamins A, C, and E fight free-radical damage and support the growth of collagen, a principal protein in the skin. Riboflavin coated tablets slide down easy and are odorless. 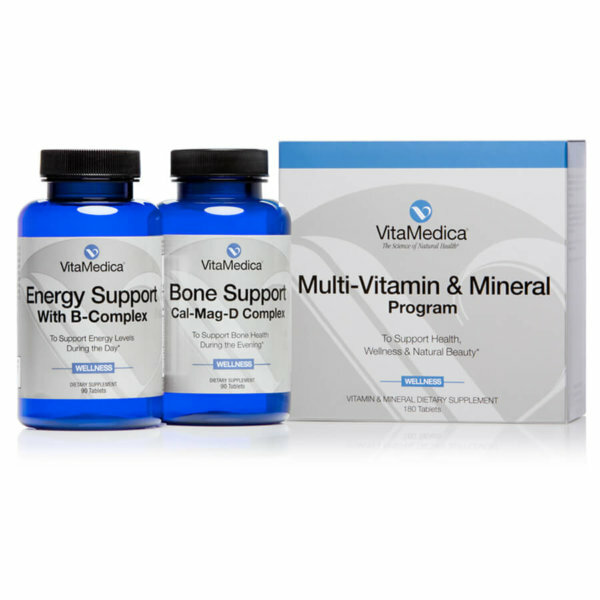 For best results, take in combination with VitaMedica’s Bone Support evening formulation. Energy Support is part of the Beauty + Wellness product line. These supplements are designed to turn-back the clock by supporting glowing skin, strong nails, and lustrous hair†. To learn more about these nutraceuticals, visit the Beauty + Wellness products section. Other Ingredients: Microcrystalline cellulose, croscarmellose sodium, stearic acid, hypromellose, titanium dioxide, silicon dioxide, magnesium stearate, polyethylene glycol, riboflavin (for color), maltodextrin, sodium citrate-dihydrate and polysorbate 80. Betatene® is a registered trademark of COGNIS IP MANAGEMENT GMBH. TRAACS® is a registered trademark of Albion Internationals, Inc. TOCOBEADS® is a registered trademark of LYCORED CORPORATION. Directions: As a dietary supplement, take three tablets with breakfast or lunch. Each individual is unique and nutritional requirements may vary. WARNINGS: Do not take if safety seal on bottle is broken. KEEP OUT OF REACH OF CHILDREN. If you are diabetic, pregnant or breastfeeding, seek advice of your physician before using this product. ENERGY SUPPORT contains niacin, which may cause a temporary redness of the skin and flushing. 1. What is the primary benefit of using Energy Support? Energy Support contains nutrients needed to stay energized and alert, and to maintain stable blood glucose levels during the day (e.g. B-complex, chromium). The full complex of B-vitamins supports healthy hair, skin & nails, and provide a counter-balance to daily stress. B-vitamins also play a role in heart health by lowering homocysteine – a risk factor for heart disease. 2. What makes VitaMedica’s Energy Support product unique? 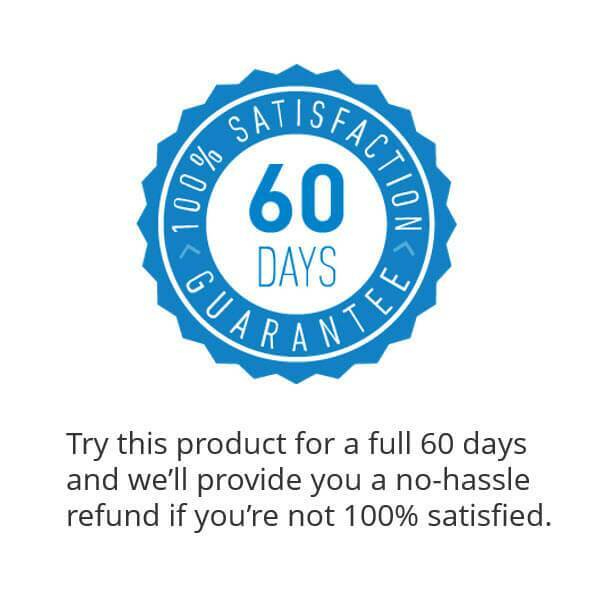 Quality – the ingredients, dosing, and formula are put together in such a manner thereby ensuring optimal absorption and utilization by the body. The formulation contains natural vitamins, which provide better absorption than their synthetic counterparts. The supplement also contains the right balance of vitamins & minerals to eliminate the worry about whether you’re taking the right amount, or in the right combination. And, the product contains chelated minerals for maximal absorption. Importantly, this supplement does not contain any preservatives or dyes which can cause an allergic reaction in some individuals. 3. If I eat a healthy diet, do I need to take Energy Support? 4. Who should use Energy Support? Energy Support is indicated for those who do not eat the variety and quality of foods to obtain essential vitamins and minerals to optimize overall health and wellness. Because the supplement is formulated with higher amounts of the B-Complex than a typical multi, Energy Support is particularly well-suited for men & women between the ages of 35 – 65 years. 5. Who should not use Energy Support? Nutritional supplements have an excellent safety track record. However, certain individuals should seek the advice of their doctor before beginning any nutritional supplement program particularly diabetics, pregnant or lactating women. Energy Support contains niacin, which may cause a temporary redness of the skin and flushing. Please refer to the Directions section for more information on precautions and contraindications. 6. The Supplement Facts Panel indicates that the source of vitamin A is from Betatene®. What is Betatene? Although most people have heard of beta-carotene, many other carotenes exist including alpha-carotene, gamma-carotene, lycopene, zeaxanthin, and lutein. While not all the carotenes convert to vitamin A, all provide excellent antioxidant protective benefits. Most supplements contain just beta-carotene and in many cases, the source is not natural but synthesized. Betatene is a naturally occurring blend of carotenes, which includes beta-carotene, alpha-carotene, cryptoxanthin, zeaxanthin, and lutein. Betatene is derived from D. salina algae and is grown on the world’s largest cultivated algae farm, located in Whyalla, Australia. 7. Energy Support is formulated with 150 mg of vitamin C. Shouldn’t I be getting more of this nutrient per day? 8. The Supplements Facts Panel refers to two sources of Vitamin E (tocopherols and tocotrienols). Why are both forms provided in the formula? 9. Several B-vitamins in the Energy Support supplement are well above the Recommended Daily Allowance (RDA). Why are the amounts this high and are they safe? 10. Energy Support does not contain any calcium. Why isn’t calcium included and should I take a separate calcium supplement? Energy Support is specially formulated with the nutrients needed to stay energized and alert during the day. Since calcium and other minerals contain the nutrients needed during the evening to promote rest and relaxation, calcium is not included in VitaMedica’s Energy Support. Calcium and other minerals can be found in our companion supplement Bone Support. The best way to obtain optimal amounts of calcium is by taking a supplement like VitaMedica’s Bone Support and by eating foods high in calcium such as low-fat dairy products, some dark green leafy vegetables, salmon, and peanuts. 11. Energy Support is formulated with bioflavonoids. What are bioflavonoids and why are they important? Bioflavonoids are compounds that are found widely in plants. These plant chemicals are responsible for giving fruits and vegetables their color (reds, yellows, blues). Good sources of flavonoids include all citrus fruits but also tea, red wine, and even dark chocolate. Flavonoids serve a number of purposes for plants including protection from insects and microbes, and like other phytochemicals, flavonoids have potent antioxidant protective benefits. Flavonoids enhance the absorption of vitamin C, have an antibacterial effect, and promote circulation. 12. Energy Support does not contain any iron. I thought iron was important; why is this mineral not included? 13. I noticed in the Supplement Facts panel the word chelate after each mineral. What does chelate mean? 14. My regular multi-vitamin contains some herbal ingredients. Why doesn’t VitaMedica’s Energy Support include these? 15. I normally take a multi along with a calcium, vitamin E, and vitamin C supplement. Do I need to continue taking these supplements while taking Energy Support? Not necessarily. 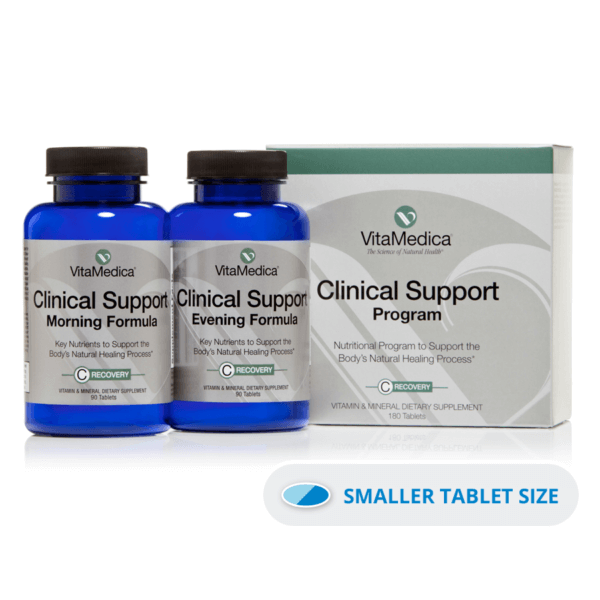 However, VitaMedica offers a Bone Support formula for use in conjunction with Energy Support. 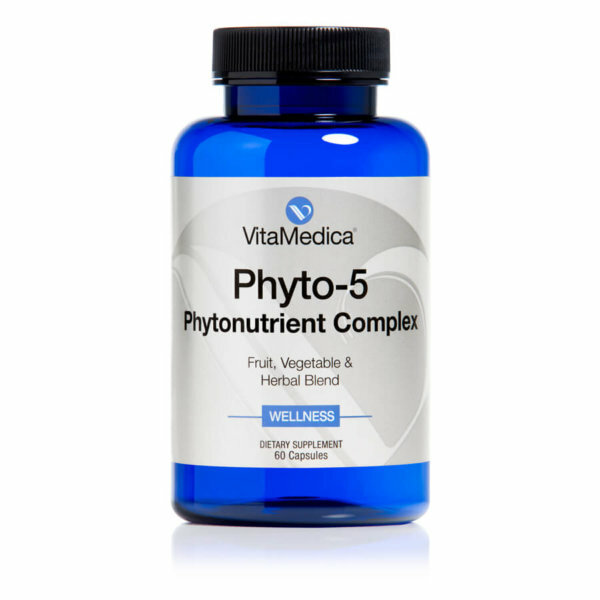 The two products comprise VitaMedica’s Multi-Vitamin & Mineral Program. One of the benefits of using both formulations is that they provide all the key vitamins and minerals necessary to obtain optimal health and wellness. For this reason, it allows many patients to simplify their nutritional supplement regimen by eliminating many of the additional supplements they have been taking. The only exception is women who have been instructed by their doctor to take additional calcium to prevent the progression of osteoporosis. 16. I noticed that the tablets are yellow. What is the reason for this and is the yellow color a dye? To protect the Energy Support tablets from damage, they are coated with the B-vitamin riboflavin which is a natural colorant. The supplement does not contain any artificial dyes or colorants. 17. I normally take a one-a-day type multi-vitamin & mineral. Why can’t VitaMedica’s Energy Support provide everything in just one tablet? 18. I have trouble taking tablets and experience an upset stomach. Is there anything I can do to help take the tablets? 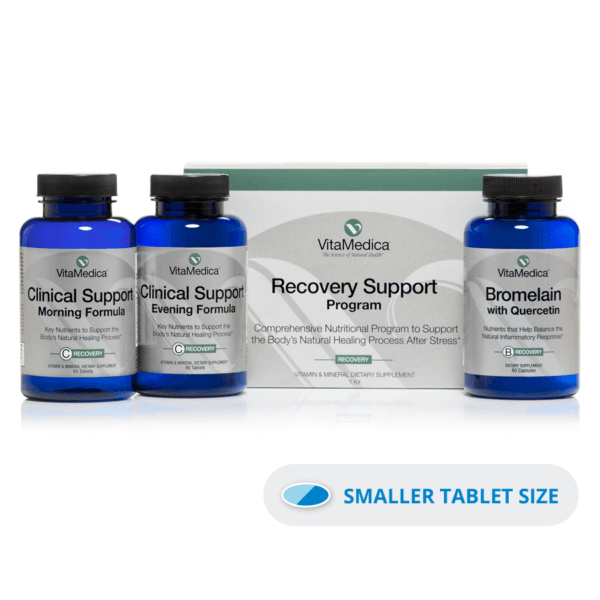 VitaMedica’s Energy Support tablets have been uniquely designed with a flatter, more oblong shape than traditional tablets to facilitate ease of swallowing, but can be broken or mixed in with some food (such as a smoothie) if necessary. For those individuals who have trouble taking tablets, eating a banana beforehand can help to slide the tablets down the throat. For those who have a sensitive stomach, taking the tablets with food can help ease any GI upset. 19. 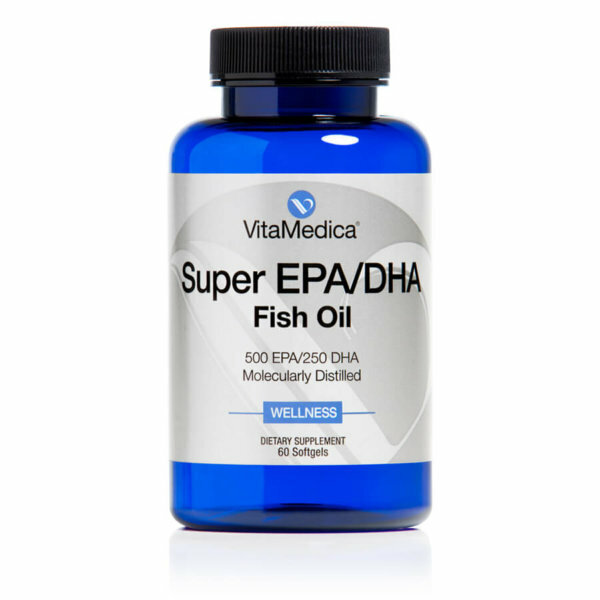 What other VitaMedica supplements are beneficial to support overall health & wellness?